AP/John MinchilloPresident Barack Obama speaks at Central High School in Bridgeport, Conn. Sunday, at a rally for Gov. Dan Malloy. The White House is trying to downplay the results of Tuesday’s midterm elections ahead of the Democratic Party’s forecasted heavy losses across the country. Polls show the GOP is on the verge of taking the Senate majority from the Democrats and expanding its majority in the House. However, speaking with reporters Monday afternoon, White House Press Secretary Josh Earnest stressed the differences between a national presidential election and these more local races. “It is important to understand, as important as this election is … a midterm election is different than a presidential election — particularly this year,” Earnest said. Earnest noted many of the competitive Senate races are in conservative-leaning states where President Barack Obama was never popular. “The electorate is different this time than it is in a traditional presidential election. So, that will be part of the calculation that’s made as we consider what sort of conclusions should be appropriately drawn from the election. I guess in other words, it would not be wise to draw as broad a conclusion about the outcome of this election as you would from a national presidential election — simply by virtue of the map,” he said. 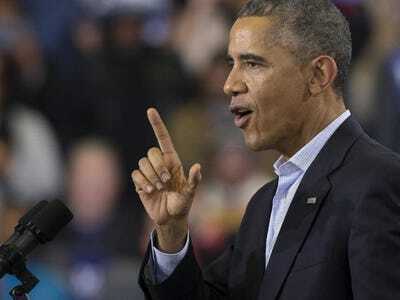 Obama, whom polls show is unpopular, has largely avoided the campaign trail in the most competitive states this year. Instead, the president has opted to rally for Democrats in staunchly liberal who are facing tougher-than-expected opposition. Obama campaigned most recently for Connecticut Gov. Dan Malloy (D) on Sunday. There are no public campaign events on his schedule Monday. Earnest further suggested reporters should look at polls showing voters aren’t motivated by the idea of “sending a message” to Obama by voting against other Democrats on the ballot this year. “The vast majority of the people say that their vote is determined by something other than sending a message to the president of the United States. So I would take those voters at their word,” he said.